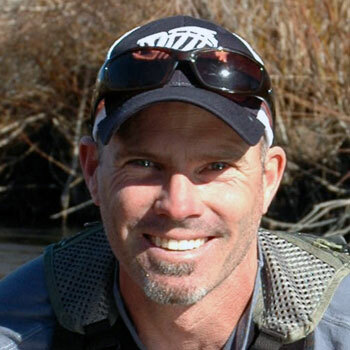 Conway Bowman's name is synonymous with "extreme" fly fishing. For Conway, home base is San Diego, where he guides for bluewater species on the fly - most notably killer mako sharks. Want to pit yourself against a mako shark? Conway Bowman tells us about his special techniques to attract, catch, and release mako sharks on the fly. This exciting new approach allows you to sight cast to Makos, see the take, and enjoy one of the most acrobatic and powerful fights of your life. His exploits have been chronicled in various books and magazines, including Field & Stream, Men's Journal, SaltWater Sportsman, and Wild on the Fly. But Conway's fly fishing prowess doesn't stop there. As former host of ESPN's "In Search of Flywater," Bowman has traveled the world in search of Atlantic salmon, wild trout, bonefish, and tarpon. He currently holds the IGFA world record for redfish caught on the fly. Bowman is now principal owner of the "Ragged Edge Fly Fishing School." For more information on Conway's adventures and guide services visit his web site at www.bowmanbluewater.com.